Tehran's provisional Friday Prayers Leader Ayatollah Mohammad Emami Kashani underlined that the ISIS has been created by Washington and Tel Aviv to pursue their interests in the region. Addressing a large and fervent congregation of the people on Tehran University campus on Friday, Ayatollah Emami Kashani said, "The ISIS and Takfiri terrorists have been created through the money and plot of the Zionists and by US power in the region." 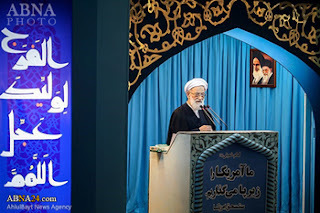 Ayatollah Emami Kashani, meantime, pointed to the two letters written by Supreme Leader of the Islamic Revolution Ayatollah Seyed Ali Khamenei to the youth in the European countries, and said, "Mentioning the issue of Takfirism and the groups that have been formed to discredit Islam in Supreme Leader's letter was of paramount importance." Iran's Supreme Leader sent a highly important message to the European youth in January 2015 to stress the Islam that the West is trying to portray is a forged concept and not the reality, demanding the younger generation in the West to do research to get firsthand information before accepting their states' propaganda. "I don’t insist that you accept my reading or any other reading of Islam...," the Supreme Leader of the Islamic Revolution said in a part of his message, and added, "Don’t allow this dynamic and effective reality in today’s world to be introduced to you through resentments and prejudices. Don’t allow them to hypocritically introduce their own recruited terrorists as representatives of Islam." "... in reaction to the flood of prejudgments and disinformation campaigns, try to gain a direct and firsthand knowledge of this religion. The right logic requires that you understand the nature and essence of what they are frightening you about and want you to keep away from," he said, and stressed, "Receive knowledge of Islam from its primary and original sources. Gain information about Islam through the Qur’an and the life of its great Prophet. I would like to ask you whether you have directly read the Qur’an of the Muslims. Have you studied the teachings of the Prophet of Islam and his humane, ethical doctrines? Have you ever received the message of Islam from any sources other than the media?"